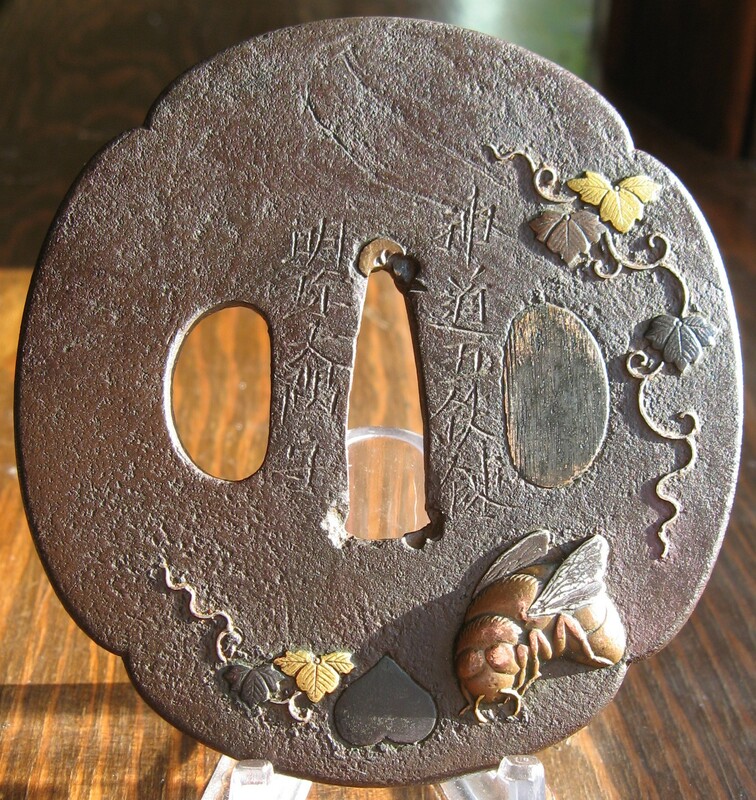 "Iron mokko mokume plate with inlay of a wasp in high relief of copper and silver. With kiri leaves and vines in gold and shakudo. At the bottom of the plate is an inome (heart shape) sukashi now filled with shakudo. 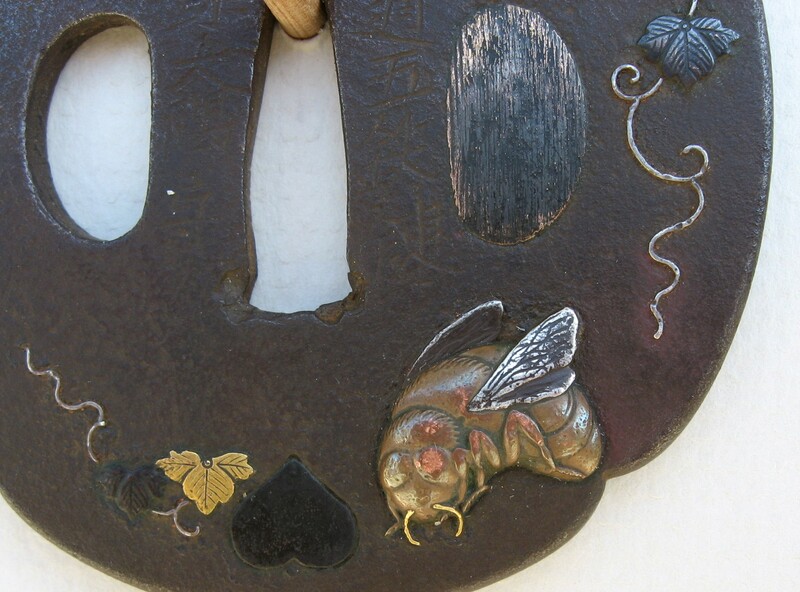 The reverse has three kiri leaves and vines in shakudo and gold. The kogai hitsu-ana is filled with shakudo. 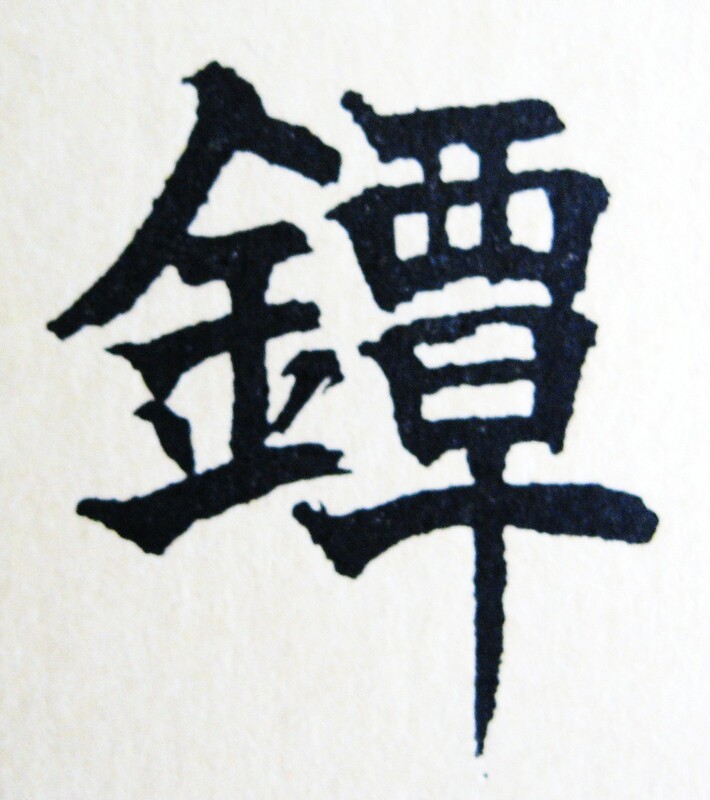 The plate is signed on the face: (right side) 'shinto go tetsu ren', a phrase implying "carefully forged iron", (left side) 'Myochin Osuminokami'. Also signed on the reverse: (right side) 'Ki Munesuke saku', (left side) "made at the age of 75". This would seem to be H 06238.0, though there are two other artists with this name but who had other titles or were of a later time. 7.70cm x 7.20cm x 0.4cm. Toso Kodogu Meiji Taikei vol. III pg. 339-340. 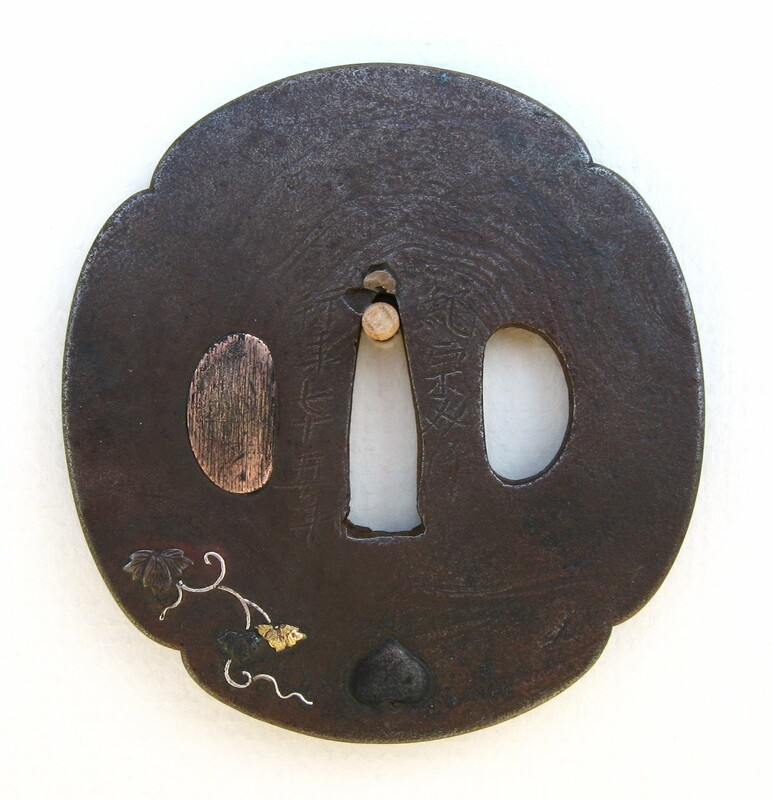 URA: (right side) 'Ki Munesuke saku', (left side) "made at the age of 75". 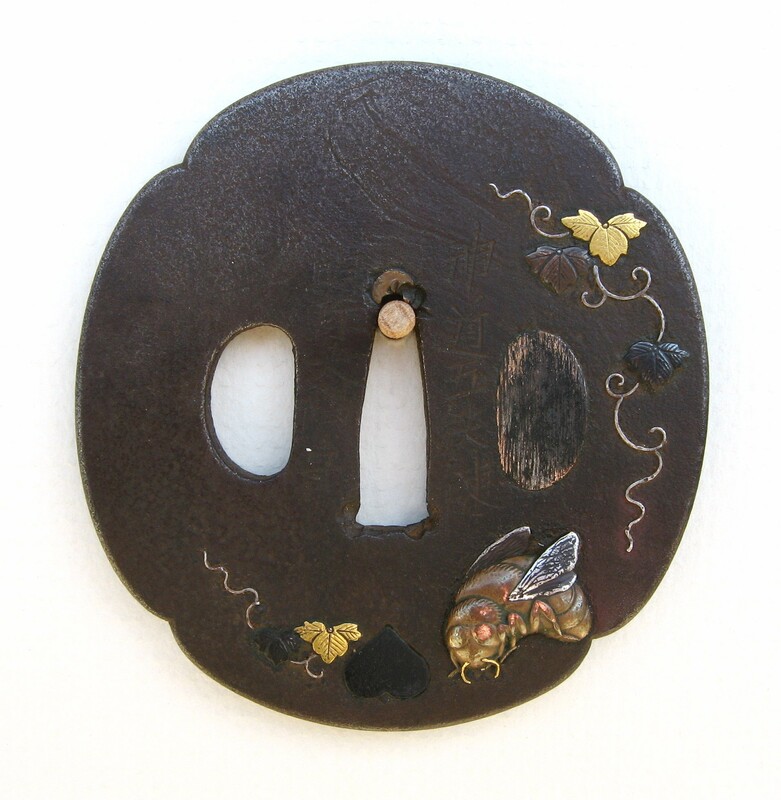 "MOKUME JI, "wood-grained ground" gives the effect of the grained wood of a piece of lumber. 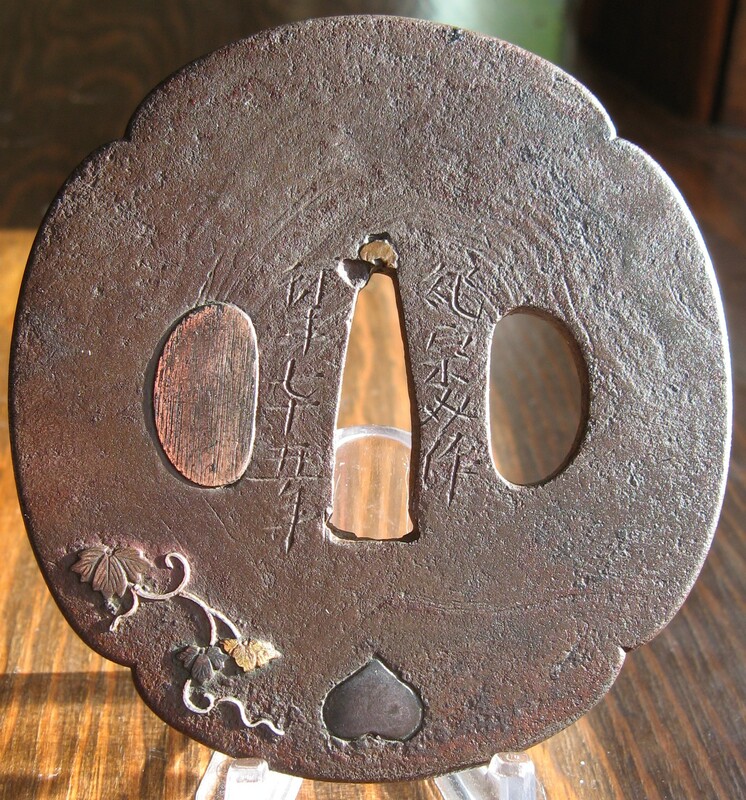 This finish is achieved by forging and diligently hammering together pieces of soft and hard iron and forming the whole into the shape of a tsuba, then treating the surfaces with an acid which brings out the fine streaks, whorl-like mottles and wood-grain texture that was formed by the intermingling of the hard and soft iron. The result resembles grained wood and has a brilliant bluish sheen.